Students continue to work on reading strategies such as visualization, while beginning to learn new methods such as annotation to help connect with texts and deepen their understanding. Students are provided with their own copy of each novel or story read so that they can highlight, underline, insert post-it notes, take notes, etc. while they read to help remember events, breakdown vocabulary, and ask pertinent questions. Teachers lead students in learning how to conduct seminar style discussions and learn strategies for providing evidence in their debates and writing using tools such as IPCE and graphic organizers. 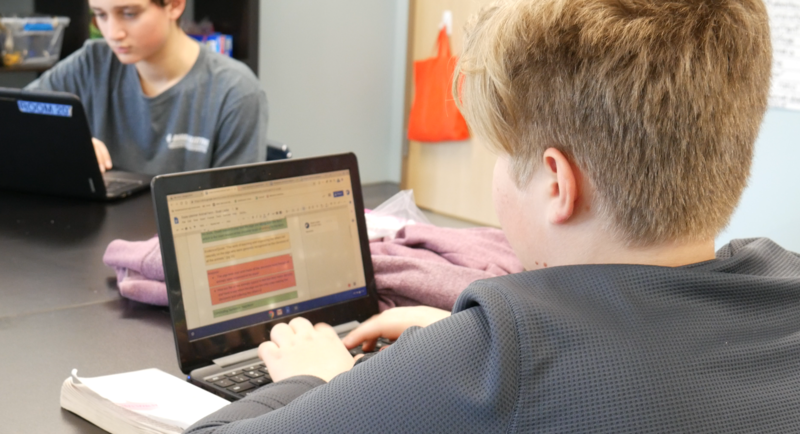 Writing is honed through our Step-up-to-Writing program where students learn to not only compose expository and persuasive writing but peer review, revise, edit, and publish their work. Grammar is incorporated into the curriculum and taught using hands-on, multisensory techniques. Students continue to practice with assistive technologies such as Learning Ally (reading), Read & Write (reading/writing), Webspiration (brainstorming/writing).